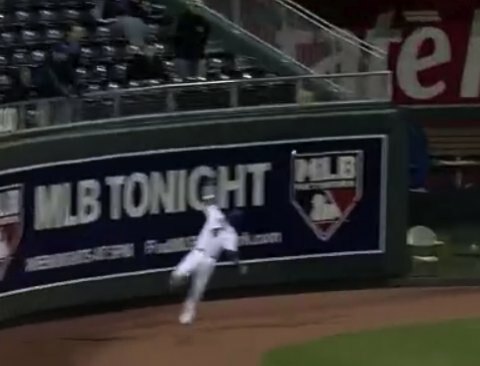 The misplay that cost the Royals the go-ahead run. Moving the Needle: Shelley Duncan laces a double to bring around the go-ahead run, +.299 WPA. Who would have thought that not only would a Royals-Indians matchup in April be a highly anticipated game, but that it would also end up being the best of the night? (Or at least close, since that’s pretty subjective.) The teams traded barbs for the first seven innings, but found themselves tied at three at the end of nine. The Indians wasted no time in extra innings, though, scoring an early run and then tacking on three more to put the game out of reach. 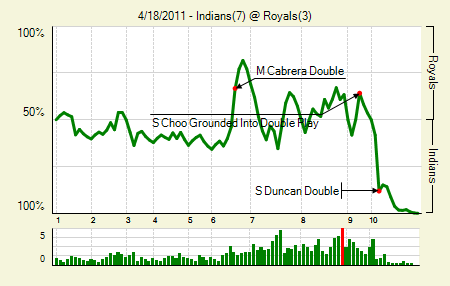 Tim Collins started the inning by walking Carlos Santana, and then gave up the double to Duncan. The assist goes to Alex Gordon, who played the ball in the corner poorly, which gave Santana enough time to round third and score easily. Aaron Crow: 1.2 IP, 0 H, 0 R, 2 BB, 2 K. He was a bit wild, as is his wont, but he did a great job cleaning up for Jeremy Jeffress. Grady Sizemore: 3 for 5, 1 2B, 1 BB. From his first two games, you’d think he didn’t miss a beat. I recommend Paul’s article on him. Moving the Needle: Jed Lowrie warns up with two RBI in the first, +.154 WPA. That single in the first only accounted for half of his RBI on the day, only a quarter of his hits, and only 1/7 of his total bases. His two-run shot in the fifth pretty much sealed this one for the Red Sox. 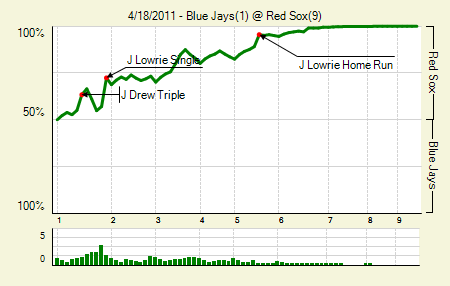 By that point the Sox had already reached a 95.5% win expectancy. The Jays never really had a shot in this one. Kevin Youkilis: 2 for 5, 1 2B, 1 HR. After two extra base hits in his first nine games he now has five in his last six games, including two homers in his last four. Daisuke Matsuzaka: 7 IP, 1 H, 0 R, 1 BB, 3 K. He allowed 12 fly balls, but none were particularly quality fly balls. Moving the Needle: Drew Butera doubles in to the corner and brings home a pair, +.175 WPA. The Twins headed into the game with the fewest runs scored in the majors. They left it in the same position, but they outscored the Orioles last night (coincidentally, the second-lowest scoring team in the majors before play). Butera opened the scoring in the second when he doubled home Michael Cuddyer and Danny Valencia. 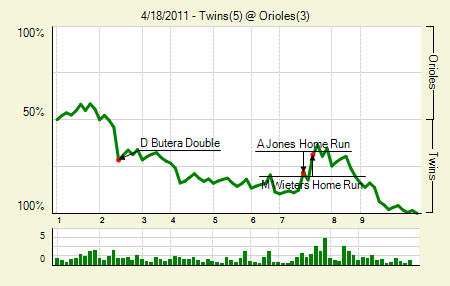 Butera struck again in the ninth, singling home a pair to give the Twins some insurance. Turns out they’d need the extra runs, as Matt Capps surrendered a homer in the ninth. Francisco Liriano: 6.1 IP, 5 H, 2 R, 2 ER, 5 BB, 2 K, 2 HR, 13 GB. Pitch to contact, indeed. Still, he averaged around 93 on the fastball and maxed out at 95.6. Also, according to Gameday, he threw only nine two-seamers to 38 four-seamers — and he really only got beat on the two-seamer. Moving the Needle: Ben Zobrist crushes one out to right, +.171 WPA. 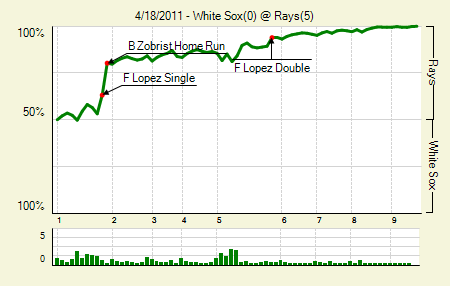 Zobrist hit one of my favorite homers of the weekend, and he came back with another work of art on Monday. He had to reach out a bit more for this one, but he still belted it perfectly, giving the Rays a 3-0 lead, which was more than enough since the Sox couldn’t get anything going. Again. The White Sox have been on some little slide. Felipe Lopez: 3 for 4, 1 2B, 1 HR. From Type B free agent to non-roster invite to cleanup hitter. David Price: 8 IP, 4 H, 0 R, 2 BB, 9 K. He took advantage of a slumping Sox lineup, but it’s tough to put up a performance like that without getting at least a little credit. 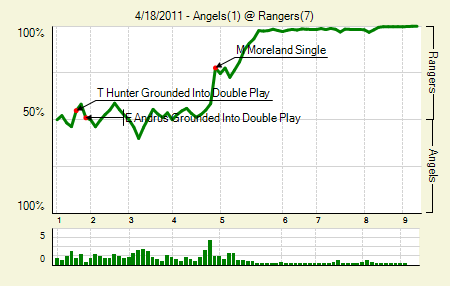 Moving the Needle: Mitch Moreland comes through with the bases loaded, +.191 WPA. This game ended up getting out of hand, but it didn’t start until the fourth. The Rangers loaded the bases after making two quick outs, putting Moreland on the hot seat, and he came through with a sharp grounder up the middle, scoring two. The Rangers would get onlt the two runs there, but an inning later they’d tack on four and put this game to bed. C.J. Wilson: 7 IP, 9 H, 1 R, 1 ER, 1 BB, 9 K, 0 HR, 11 GB. The Angels didn’t get much going, but that’s because Wilson didn’t give them much of a chance. He really scattered those nine hits, though the Angels did get three, and a run, in the seventh. Ian Kinsler: 2 for 3, 1 2B, 1 3B, 2 BB. He had six extra base hits in his first nine games. These were his first since then, ending a six-game drought. Adrian Beltre: 2 for 4, 1 HR. That’s his fifth homer of the year. He’s still walked only once, but with nine extra base hits I guess I understand why he wants to hack. 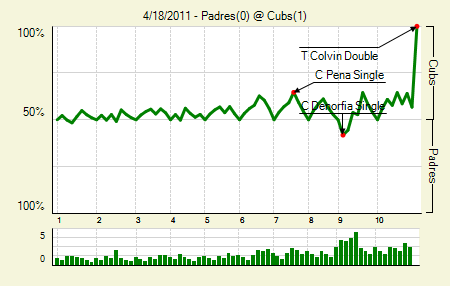 Moving the Needle: Tyler Colvin finally breaks through in the 10th with an RBI double, +.432 WPA. It’s amazing sometimes, the WPA difference between a walk-off hit with none out and a walk-off hit with two outs. Colvin got the latter in the 10th inning of a scoreless game- a liner down the line that rolled all the way in to the corner, which gave Geovany Soto time to score from first. It was not only the walk-off hit, but also the only extra base hit by either team. Carlos Zambrano: 8 IP, 3 H, 0 R, 1 BB, 10 K, 11 GB. He retired the last 13 batters he faced, and also faced only the minimum from the third through the eighth. That’ll help make up for three crappy starts to open the season. Tim Stauffer: 7 IP, 4 H, 0 R, 1 BB, 4 K, 10 GB. They lifted him for a pinch hitter — Brad Hawpe, no less — with none on and two out in the eighth. He was at 95 pitches, but still, getting him out an inning early meant San Diego going to its non-elite relievers one inning sooner. Moving the Needle: Neil Walker fires the opening volley, +.091 WPA. The Pirates asserted their dominance pretty early in this one, taking a 3-0 lead in the first and a 9-1 lead by the fifth. Neil Walker got things started with an RBI single, which also put runners on first and third with one out. Steve Pearce and Chris Snyder added RBI singles of their own, and the Reds just couldn’t get anything going. Kevin Correia: 9 IP, 4 H, 3 R, 2 ER, 2 BB, 5 K, 1 HR. Lots of contact, and more fly balls than ground balls. 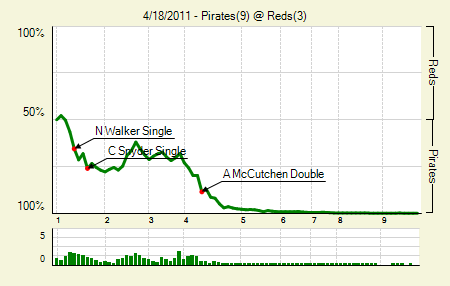 But it was apparently enough to quell the Reds bats. Go figure. Jose Tabata: 2 for 5, 1 2B, 1 BB. His hot start continues, though he didn’t manage to drive in any of those nine runs. Aroldis Chapman: 1 perfect inning, 1 K. His fastball averaged over 100 mph, so rest was apparently all he needed. 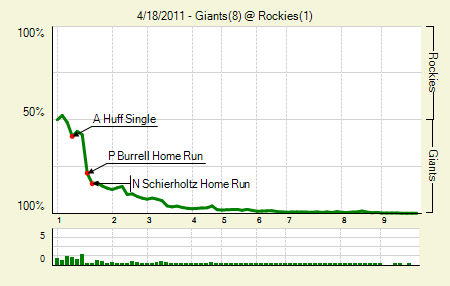 Moving the Needle: Pat Burrell launches a three-run shot in the first, +.206 WPA. Somehow Esmil Rogers lasted three innings in this one. He gave up eight runs in that span, including five in the first inning. The decisive hit came of the bat of Burrell, who destroyed a 2-1 fastball. That gave the Giants a 4-0 lead, which they’d extend in the second with another homer. Two more runs in the third finally drove Rogers from the game, and the Rockies never really had a shot. Tim Lincecum: 7.2 IP, 3 H, 1 R, 1 ER, 3 BB, 10 K, 0 HR. He apparently had a no-hitter through six, but Carlos Gonzalez ended that nonsense. I’m thinking we shouldn’t put on the no-no alert until the pitcher is through seven. Nate Schierholtz: 3 for 4, 1 HR. Understandably, he hasn’t gotten much playing time this year. But he’s made the most of his opportunities. His homer, 465 feet, is the fifth longest so far this season. Freddy Sanchez: 2 for 5, 1 2B, 1 HR. That’s eight extra base hits on the season for Sanchez. I thought his .381 wOBA would rank highly among second basemen, but it appears that position has gotten off to a hot start; Sanchez’s offense ranks just seventh among his peers. Moving the Needle: James Loney drives in two with a single, +.146 WPA. 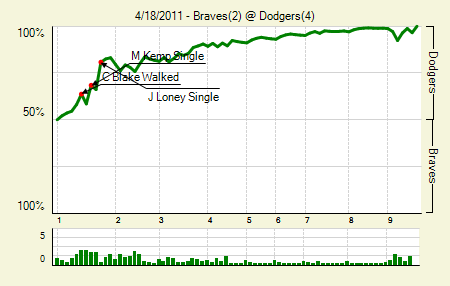 The Dodgers batted around in the first, but managed to score the minimum three runs in that situation, which ended up burying the Braves, who didn’t score until the ninth inning. The big hit came from Loney, whose two-out single gave the Dodgers an early 3-0 lead. They’d get another on a sac fly, but this was the key inning. From the second through the sixth Tim Hudson retired 12 of the 14 hitters he faced, including the final eight in a row. Gerald Sands: 1 for 3, 1 2B. Lots of Dodgers fans were excited for Sands’s debut, and were probably overly enthralled when he hit a double in his first at-bat. He also drove in a run with a sac fly in the third. Ted Lilly: 7 IP, 4 H, 0 R, 2 BB, 6 K. Nothing really remarkable about this one. Just a solid performance that put the Dodgers in a favorable position. Moving the Needle: Pete Orr ties the game in the ninth, +.420 WPA. The Brewers clung to a 3-2 lead heading into the bottom of the ninth, with the bottom of the Phillies’ order due up, which should have been a task John Axford could handle. He did not. Carlos Ruiz opened the inning with a walk, and then took second on a sac bunt. Orr, pinch-hitting for the pitcher, dunked one into shallow left-center for the easy game-tying hit. Apparently Ryan Braun thought otherwise, as he air-mailed one way past home plate. It was as comical as Orr’s hit was clutch. 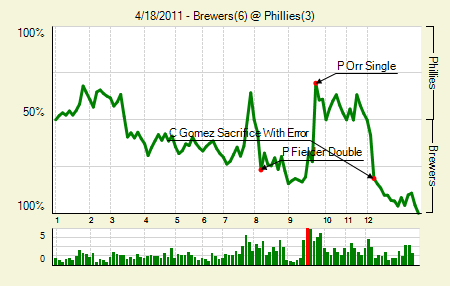 The Brewers re-took the lead in the 12th, but it was on a pair of sac flies, hence the low WPA marks. Joe Blanton: 7 IP, 7 H, 2 R, 2 ER, 1 BB, 4 K, 12 GB. While the Phillies’ pitching won’t win them every game, rare will be the instance when they fail to make it a game. Get this from Blanton every third start and that’s one helluva season. Shaun Marcum: 6 IP, 5 H, 1 R, 0 ER, 0 BB, 5 K, 11 GB. You’d like to see him throw fewer than 102 through six, but he still pitched a heckuva game. 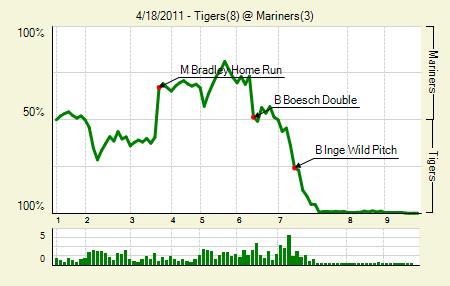 Moving the Needle: Milton Bradley lays into one and gives the Mariners a lead, +.267 WPA. The Mariners did look good in this one, getting some solid pitching from Jason Vargas. Bradley backed him up, too, with a monster two-run blast, 425 feet, to give them a 2-1 lead in the third. Leave it to the M’s bullpen to blow a solid start. They allowed six runs in the seventh, which put this one out of reach. Brennan Boesch: 2 for 3, 1 2B, 2 BB. He drove in the first two Tigers runs, though he was only credited with an RBI on the first. The second involved a Bradley error. Miguel Cabrera: 2 for 4, 1 BB. The Tigers backed him up by bringing him around to score each time he reached base. We hoped you liked reading The Morning After: Game Recaps for April 18th by Joe Pawlikowski! Reassuring: Liriano got a quality start. Not so reassuring: 5 walks and 2 strikeouts from one of the top strikeout getters last year.